Flicker Alley is proud to present the following essay by Jeff Lundenberger. A graduate of Thomas Edison State University, Jeff Lundenberger is an ardent classic film fan who is a regular contributor to blogs, printed publications, and classic film series. In 2016, he returned for his second year to work with the TCM Classic Film Festival as a Social Producer. Jeff is a graphic designer, working with The New Yorker and Condé Nast Traveler magazines. He lives in Asbury Park, NJ, with his film-supportive husband. 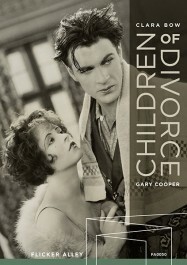 Clara Bow and Gary Cooper featured on the cover of Children of Divorce. I went to Capitolfest for the first time in August of this year after much prodding from classic film friends who had already attended the film festival and raved about the experience. Held in the Capitol Theatre, a 1928 movie palace in Rome, NY, the festival focuses on rare silent films and talkies of the late 1920s and early 1930s. Thirty-five mm prints supplied by various national archives are screened and the silent films are accompanied by the theatre’s Möller Theatre Organ. Now that I have attended Capitolfest I must agree with my friends—it’s a great film festival! An early Hollywood star is highlighted at the festival each year. This year, to my delight (as I have long been a fan) that honored actor was Gary Cooper. He appeared in five of the feature films screened at the festival, plus a short, Lightnin’ Wins (1926) (in which he’s billed under the star Lightnin’ the Dog), and a fragment of Arizona Bound (1927), considered to be his first starring role. I hadn’t seen any of the festival films before. In fact, I didn’t even recognize any of the titles, including those starring Cooper, but I found them to be an interesting and varied mix of comedy, drama, musical, and, in the case of Just Imagine (1930), downright silliness. The question of the day among festival-goers was “What was your favorite movie?” and according to the people I spoke to, one film stood out: Children of Divorce (1927). Cooper stars in that film with Clara Bow, Esther Ralston, and Einar Hanson. To tell the truth, I had never heard of either Ralston or Hanson before, but that’s one of the joys of Capitolfest: discovering new (old) films and the sometimes unfamiliar faces starring in them. The lights dim, the curtains part, and you watch the movie for the first time with fresh eyes and little expectation. In that spirit, I don’t want to say too much about the film, since I know many of you will be seeing it soon when it’s released on disc by Flicker Alley on December 6. Suffice it to say that three children meet at a Parisian “divorce colony,” where they’ve been left by their parents. Bow, Cooper and Ralston are those children as grown-ups, a relative term as they proceed to make a complete mess of their lives. There is a mismatched marriage [Several other Capitolfest films concerned couples marrying for unlikely reasons. It seems to be a common theme of that time period], and a line so delicious I can’t resist sharing: “Poverty would kill our love.” Definite words of wisdom. Of course I had heard of Clara Bow. I’ve had the pleasure of seeing several of her films on the big screen at the TCM Classic Film Festival, another must-attend event for the serious classic film fan. In fact, at that festival I saw both Clara Bow and Gary Cooper in Wings (1927), a star turn for Bow, a small but memorable part for Cooper. Cooper also had a small part in Bow’s picture It (1927), but Children of Divorce was the only film in which they co-starred. It is rumored the two had an affair over the course of the making of the three films, unsurprising given the mores of 1920s Hollywood… and the reputations of the two stars. Publicity still of Cooper and Bow for Children of Divorce. But I somehow never thought of these two as contemporaries, even though I had seen them both in the same film. Bow continued making pictures into the early sound era. In fact, I‘ve seen two of those, Call Her Savage (1932) and Hoop-La (1933), at the TCM festival. She was quite good in them, her charisma undiminished, for me at least, by her Brooklyn accent, often cited as a contributing factor to her fall from grace as a star. Still, I tend to think of Bow as a silent actress, the “It” girl, the embodiment of the 1920s flapper. According to writer Elinor Glyn, who coined the term, “It” is “self-confidence and indifference as to whether you are pleasing or not,” definitely a characteristic of Bow and many of her creations. She was not exactly beautiful, but very attractive with her round face and thick, red (so we’re told, it is in black and white after all) hair, a living Betty Boop. She certainly had something! Charm, vivacity, and a driving energy that transcends the screen, Bow was a glimmering presence that elevated the films she was in, even those considered inferior to her ample talents by critics of the time. Gary Cooper, four years older than Bow, is best known for his later roles—Longfellow Deeds, John Doe, Lou Gehrig, Alvin York—thoughtful, sensitive men of few words (Cooper reportedly shortened lines of dialogue in some films to the more succinct “yep” and “nope”), characters who were somewhat naive or possessed of an awkward, unvarnished innocence. Hick, hobo, hero—he played a common man that both men and women could relate to, the best-looking man in the room who has no understanding of the power that offers. He had a beautiful, expressive face that could break hearts with a pursed lip or a flickering shadow that would cross his wide-set, haunted eyes. 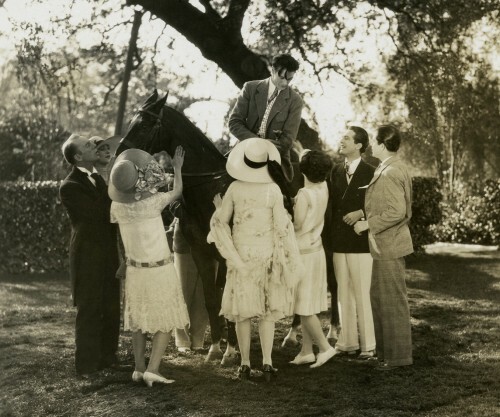 Cooper on horseback in a scene from Children of Divorce. Clara Bow grew up with little, a poor tomboy from Brooklyn, and got her start in pictures after winning a “Fame and Fortune” acting contest. Gary Cooper was a lawyer’s son from Helena, Montana, and spent three years at a school in England. He looked good on a horse, which helped get his career started as an extra in Westerns. Both had no stage experience or training before entering the movie business. Despite her early notoriety for romantic “freedom,” Bow moved to a ranch with her husband, Western star Rex Bell, once she left the movies, her career little more than a decade long. Cooper lived in the Los Angeles area throughout his approximately 35-year career and continued to lead a much more exposed, “Hollywood” life. Always known as a ladies’ man, his marriage to long-time and long-suffering wife Veronica barely survived a separation during his very public affair with actress Patricia Neal. He continued acting until nearly the end of his life. Bow and Cooper died four years apart, both at the age of 60. Clara Bow and Gary Cooper were both, in their time, major Hollywood stars with widely divergent careers, but they crossed paths in three silent films. By the time those films were made she had hit her stride in the business while he was just getting started. Together and apart they left us with some remarkable, lasting motion pictures, including the little-seen (but not for long) gem, Children of Divorce. Pre-order Children of Divorce on Dual-Format Edition Blu-ray/DVD for release on December 6, 2016 and save 25% off MSRP for a limited time! Never miss a blog post! Sign up for our RSS feed using the form below to receive e-mail notifications of new blog posts! More Children of Divorce essays coming soon!